We're forwarding to you a message from Jocelyn DeAngelis, of Rutgers University. Jocelyn is the project manager for a research study currently underway by Marie Radford and Lynn Silipigni Connaway. Their study is an evaluation of chat services from several perspectives. Jocelyn's message describes the study and the intended survey with end users in the U.S. We hope you will consider implementing their suggested message to your chat patrons as a custom message in the transcript that is e-mailed at the close of every session. Since the call for participants is for a limited time only--currently estimated to end August 31--the nearer the beginning of the e-mail you place the message, the more likely it is to be seen. Or perhaps you can think of other ways to highlight it. On behalf of the Seeking Synchronicity research team, thank you for your consideration. Documentation updates for the July QuestionPoint release are now available. Links to the updated or added documentation are available in the What's New area of the QuestionPoint Documentation page. The QuestionPoint team welcomes your comments and suggestions about the documentation. Please contact me or click the Comments? link on the Documentation page. On the knowledge base survey of June 2006 and throughout this past year, we've had requests from QP users for more information about the QuestionPoint knowledge bases. Some have said they would welcome a training or orientation session. In addition to the virtual reference discussion, two QP team members will be at the conference to present papers. We will post a summary of our discussion on the Blog, for those unable to attend. I hope to see some of our QP community at IFLA! At this time, we do not anticipate more than a 15-minute outage, around 0700 GMT. We will confirm or change that estimate a little later this week.We'll post more information later, concerning downtime. 1.1. NEW PATRON line shows time elapsed. When a New patron appears in your chat monitor, you can see how long the patron has been waiting. The Time column counts up in 10-second increments. In the 24/7 Cooperative this helps librarians see immediately if they should wait for the home library, if monitoring, to pick up (a sixty-second wait is recommended) or pick up the patron themselves. 1.2. PRACTICE CHAT FORM opens for any monitoring library within the same BME. Before this release, only the library that opened the Chat Patron Practice Form could see the patron in their Practice Queue. With this release, multiple libraries within the same BME can practice with one another using the practice form. Remember that you must select the Practice Queue to see "patrons" using the Chat Patron Practice Form. 1.3. PATRON’S CHAT FORM CAPABILITIES display enhanced. Librarians can see additional information about the patron’s chat form capabilities with this release. The patron information area for patrons using the new Chat Preview 2 displays "Chat: Text, Links" to indicate that this patron’s form can accept text and links only. This is the first in a series of enhancements planned for patron form control. Session times and wait times are now stored correctly so they are sortable when imported to an Excel spreadsheet without the need to convert the integer type. Group administrators wishing to run offline reports on a single institution can now save that report intact. Heretofore, all parameters of the report were saved except the institution name. That bug is fixed with this release. 2.3. PATRON'S ACCOUNT INTERFACE locks in-progress chat session. In some cases, when a patron navigated away and returned to the chat monitor after being timed out (two minutes), they would use the patron account link to log into their account and continue the chat dialogue. This could occur only if the librarian had not yet closed the chat session from the librarian monitor. When it did occur, multiple notification messages were sent, often resulting in confusion. 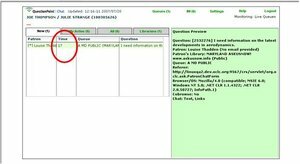 Now, a session that has not yet been closed by the librarian, whether ended or not, is locked in the patron’s account the same way it is locked in the library’s Ask module. The patron is unable to act on that session in any way until it is closed. There’s been a lot of talk in the community about how libraries can use Web 2.0 concepts and services to reach out to users more effectively. There was a RUSA pre-conference at ALA devoted to this [Reinvented Reference III: Emerging Technologies for Reference Services], and many of you may have set up blogs, podcasts, vlogs, and wikis to connect with your users. Based on this review, an analyst at Hitwise looked at the number of visitors to each of the 6 sites in the review and found that, at least for one week ending Dec 23, 2006, Yahoo! Answers received 96% of all visits to these sites.http://weblogs.hitwise.com/leeann-prescott/2006/12/yahoo_answers_captures_96_of_q.html At least in the social answering world, it seems that more answerers lead to better answers. How can QuestionPoint utilize successful social software concepts to improve reference services? On the one hand, we have a community of librarians. Can we make it easier for librarians to work together to provide great answers to their users? Currently QuestionPoint subscribers have access to the Global Reference Network (GRN). Here’s how it works: if a QP librarian needs assistance in answering a question, the librarian may use the Refer to Global Network option in the Ask module. The software uses best-match routing (using information from your library profile) to find the institution best able to answer the question. When a match is found, the question goes into the local reference librarian’s queue of new questions. The GRN is not heavily used and its underlying structure was designed years ago. How can we make it easier for librarians to work together collaboratively to provide the best answers to their users? 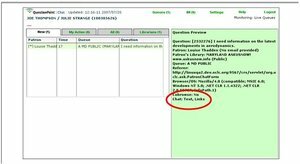 Is there a way to bring the “Stumpers” model (a listserv where librarians post difficult questions and get suggested answers from list subsribers) into the GRN? The above is still based on the model that a librarian takes a question from a user and provides an answer to that user: one-to-one. The community answering services (Yahoo! Answers et al) are not based on this model at all. Should libraries provide opportunities for users to see questions and answers provided by librarians (assuming, if the user consents)? Should the librarians then accept answers from “civilians” (non-librarians)? Does the type of question matter? How does this affect our role within the community? Thanks for your feedback on this! 3) ABOVE THE BOTTOM OF THE SCREEN! ("Above the fold"). This should ideally be true at 800x600, but definitely at 1024x768. Every service needs promotion - please share your ideas too! Librarians that participate in cooperative answering services rely on the policy page of each participating library in order to provide accurate information - that way the librarians can better serve patrons from a variety of libraries. But what if the information on the library’s policy page is incomplete? We now have a way for the chatting librarian to send a message directly to the policy page contact at the library. When you open the library's policy page, there is a field for “Policy Page E-mail Contact”. By clicking on this link, you will open a form which you can fill out, then submit. Your suggestion will go directly to the Policy Page contact at that library. Use this form to report any omissions or other issues regarding the library’s policy page. This will help the library provide more complete information on its policy page, which will result in better service to the patrons. All libraries that participate in the 24/7 Reference Cooperative should be sure the field “Policy Page E-mail Contact” is filled out with a personal email address. Be sure and just use the email address itself - no names or parentheses. Once you change this field, be sure your policy page is Viewable (this is the first field on the form). Please comment if you have any questions or ideas for further improvement of the library policy pages. The QuestionPoint user group met on Monday June 25 at the Library of Congress, from 3:30 PM to 5 PM. Approximately 70 people attended. From 24/7 Cooperative members, co-browsing, response time problems, and policies and procedures were mentioned more often than anything else as complaints. Too few patrons are configured to make use of co-browsing, or co-browsing does not work well with too many sites. Work with multiple patrons sometimes still creates concerns about response time, as transcript displays may lag behind patron pick-up or switching between patrons. Policies and procedures are critical to a successful cooperative, but some felt there were too many to remember. Yellow Cards: What do you like? Jeff Penka and Susan McGlamery addressed some of the comments with updates and plans for future releases. Jeff also mentioned some of the technical hurdles that make some requests, for example IM integration, particularly challenging. While we always need to take stock and get reality checks, we can probably truthfully say that most of your complaints or enhancements requests have already been logged and either await evaluation and prioritization or have been noted as important but requiring more significant resources and investigation than are possible in the short term. And we appreciated your “yellow remarks,” too! They have provided us a pat on the back and the determination to meet needs and expectations. Thank you! Another discussion at the meeting of note was how to get updates that have been posted to the blog. We took down suggestions and plan to meet next week to explore what we can do to push postings and follow-up comments out to your e-mail boxes. Please add your comments below!